It’s only a couple of days until 1 April when this year’s A to Z challenge commences. It takes determination to persist with the 26 posts, not to mention visit others who are blogging along with us. 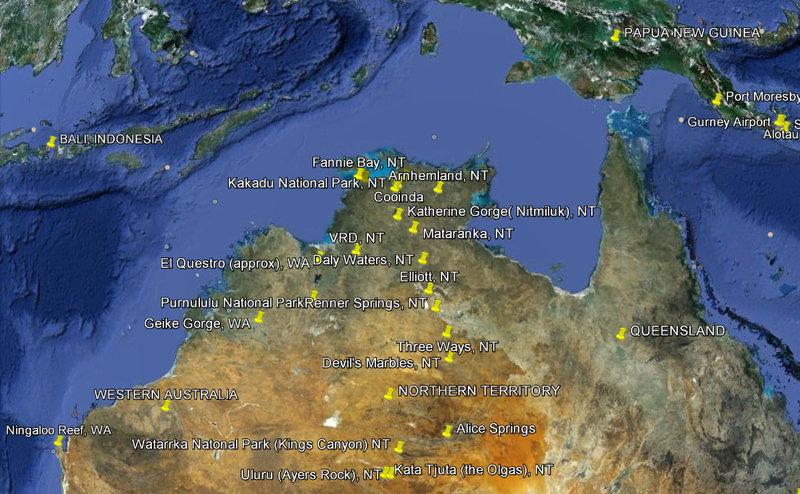 As I’m something of a travel obsessive, the 2013 series will have a travel theme, but this year I hope to introduce you to places you may not know, or even have heard about: Australia’s Northern Territory (NT) with skirmishes across into the top half of Western Australia (WA) as well. All the places will be ones I’ve visited and I’ll be including at least one photo of each place. Like many places, Australia has its own language peculiarities so you’ll need to take along a little knowledge of our colloquialisms, which I’m going to call Aussie-isms. Each day I’ll give you a few catchy words or phrases that are needed if you’re not to be bewildered when you visit. Most of the time in the Top End (the top half on the NT and WA), it is HOT. Unlike other places we have two seasons, the Wet (December to March/April approx) and the Dry (April/May to August). Actually we have three seasons, though we try to ignore the September to December zone, as that’s the Build Up, sometimes known as Mango Madness because (i) that’s when the mangoes flourish and fruit and (ii) people go nuts because of the heat and humidity. The humidity is the key difference between the two main seasons and temperatures which may look similar based on numbers can be very different on the ground. And when we say, Wet, we do mean wet: cyclones, monsoons, and lots and lots of rain. Roads flood and become impassable and many tourist sites are inaccessible because of this and also the even higher risk of crocodiles. Lightning is a feature of the Wet as are monster storms with crashing thunder. 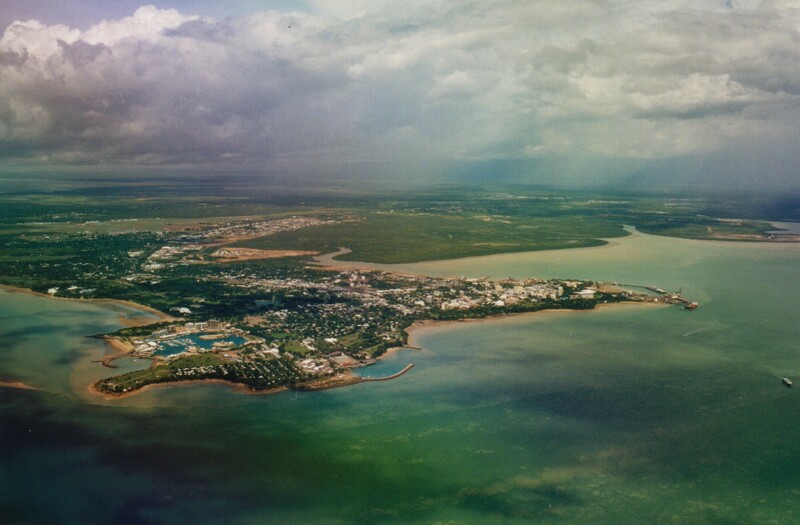 An aerial view over Darwin c2001. A Wet Season storm is brewing. Dry means just that: brides-to-be can plan their outdoor wedding months in advance in the almost certain knowledge there’ll be no rain. We can go for months without a drop of rain. Our temperatures are in Celsius which won’t be familiar to some people so here are some clues: 35C=95F; 20C=68F (and sees people reaching for Ugg boats and jumpers!) 0C=32F. There’s an awful lot of wide open space out there and it’s a “long way between drinks” once you head out of Darwin. To reach two other capital cities, Brisbane and Adelaide, it is approximately the same distance as London to St Petersburg or San Francisco to Missouri. Another factor of the distance is that Bali and Singapore are closer than, or as close as, other major cities in Australia, making them regular holiday destinations. As a result the Top End has a very Asian flavour. Australia has a bad reputation for having a lot of things that can kill you. Unfortunately they’re a less obvious than brown bears, for example. The northern half of the country is especially prone to hazardous wildlife: crocodiles and stingers outweigh the fear of sharks in the water so that few people swim in those beautiful blue waters; underwater there are poisonous shells, deadly stonefish, particular tropical fish and sea-snakes not to mention lethal snakes, spiders and scorpions on land. Oh, sorry, that’s right I’m trying to encourage you to come visit our wide brown land! On the other hand we have wide skies, vivid colours, stars dense in the sky and some pretty quirky mammals. 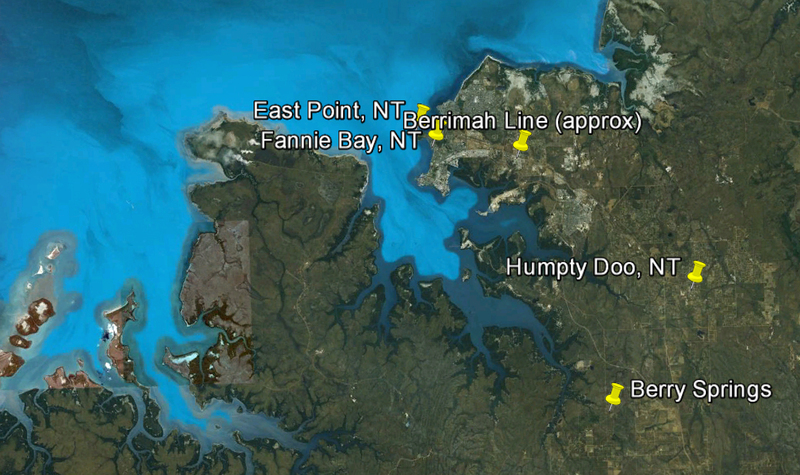 I do hope you enjoy your excursions into Australia’s far north and Red Centre. Thanks for joining me! My A to Z series for 2012 was about the important places to my family history, both historic and recent. The 2012 series was on my family history blog, Family History Across the Seas. If you’re interested in reading any of the stories (V was very popular), you can find them through this link. This entry was posted in A to Z Challenge 2013, Australia, Travel and tagged A to Z challenge 2013, Northern Territory, Travel, Western Australia by cassmob. Bookmark the permalink. Well, you certainly make it sound inviting with the snakes and poison spiders etc :O The sky and the stars do sound good though. It’s 67 degrees here in Atlanta today and I’m getting ready to open the door!